I saw your ad on Craigslist for the RETRO TABLE LAMPS http://montreal.en.craigslist.ca/hsh/2167580066.html. Although I am not interested in purchasing them I would like to offer you a business opportunity. You see I am a bit of a master when it comes to writing the text for Craigslist ads but I lack the photographic skills that you have. 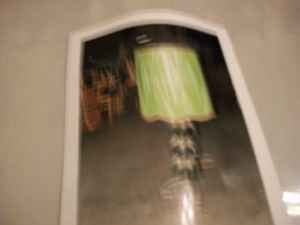 For example, I never would have thought to take a photograph of the lamp in a mirror at a weird angle, although it does make total sense now that I see the photo. I guess that is the only way to get the image so out of focus on some cameras? So what I am thinking is that we could team up. I would write the copy, and you would handle the photography and presentation. Just to give you a taste of what we could do together here is what I might write to accompany your photo. light Maker!!!!!!! colour=green sale. Also has mirror. What do you think, should we team up?